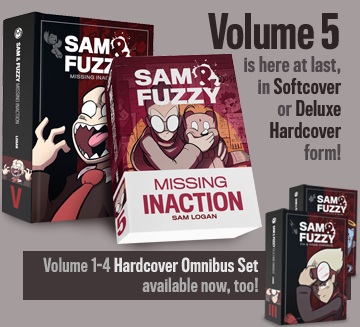 The final deadline to order Sam and Fuzzy stuff in time for Christmas has now passed. Of course, if you don't care about Christmas delivery... go ahead and order whatever you like! I am not going to judge you. Big thanks to everything who picked something up this December... or any other time this year, for that matter. 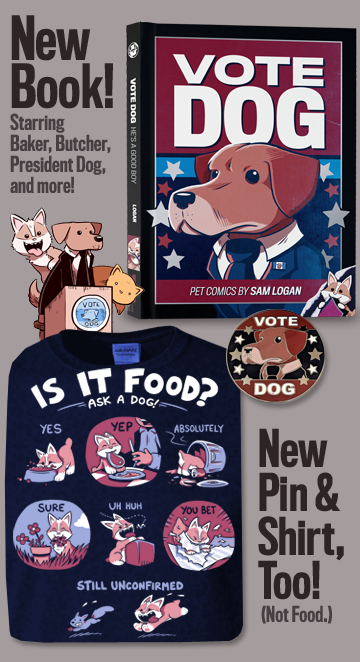 It's your support of my books, shirts, art, and other swag that allows me to keep drawing all these comics! I'm sorry, everyone. That joke was totally uncalled for. I don't know what came over me. Good timing, Nick! As you probably saw on Monday, the current storyline will actually be touching on this issue a bit! But to make a long story short... yes, Sam definitely realizes that, and has tried his best to keep as many ninja mafiosos gainfully employed as possible. But when you aren't making enough money to pay them, there is only so much you can do! So that it would stop obscuring so much of his fantastically expressive eyebrows! Seriously, that's the reason. I mean, it's my reason, more that Aaron's... but making his face easier to see and less visually cluttered is why I gave him a different haircut. Man, imagine what the real world would be like if modern fashion was dictated entirely by the need to communicate clear facial expressions, easy-to-read body silhouettes. You could pretty much say goodbye to Lady Gaga. That's it for this week. See you on Monday! It's getting down to the wire, but if you're still hoping to nab any of our t-shirts or Christmas cards in time for the holidays, the pros at Topatoco can still make it happen for the next few days. Order any of our in stock t-shirts by priority mail (US orders) or express mail (international orders) for assured pre-Christmas arrival. Or alternately, order by regular mail and give the gift that says, "I am giving you this several days late, but hey... it's still pretty awesome, right?" You class act, you!